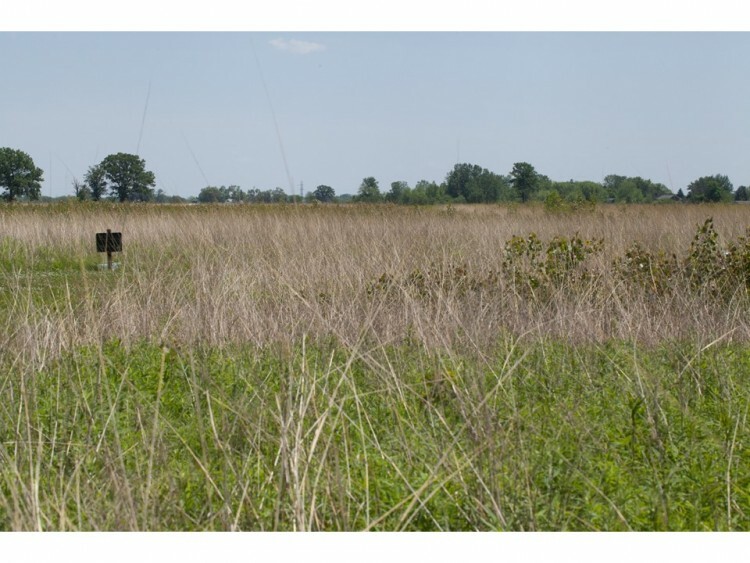 Here is a wet meadow in Franklin County, Ohio. 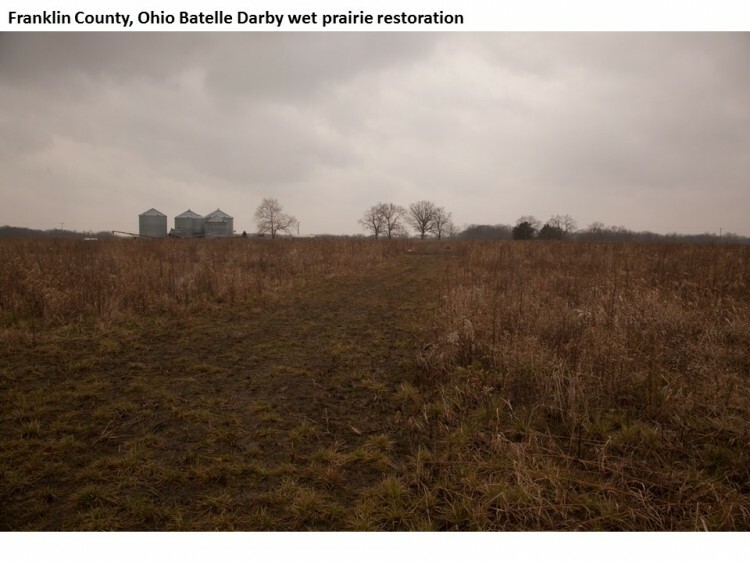 The Franklin County Metro Parks wisely purchased this while it was farmland in the watershed of Big Darby Creek, a State and National Scenic River. This is a pristine watercourse known for its richness in fish and mussel diversity. Both to help protect the creek from run-off and create wildlife habitat on-site, the Parks people in 2010 restored natural hydrology by breaking drain tiles, and planted prairie grasses. Here grows, quite abundantly, the most magnificent living thing that nature ever selected. 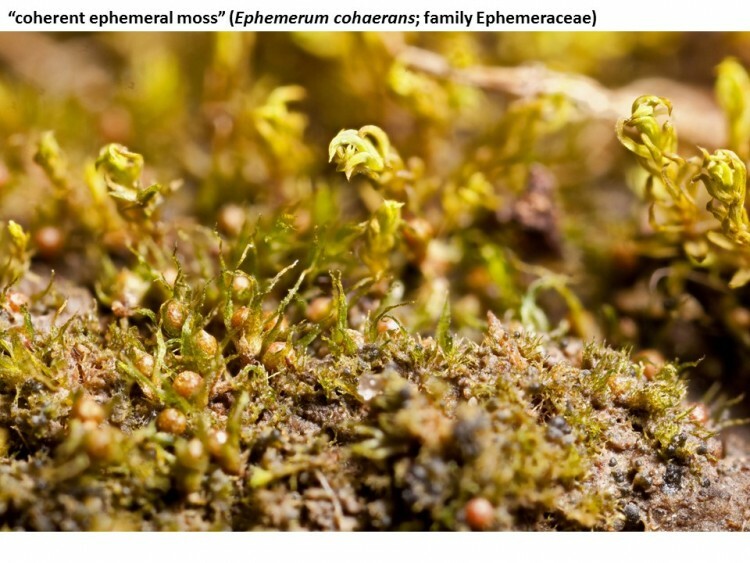 It’s urn, goblet, or bladder moss, Physcomitrium pyriforme. 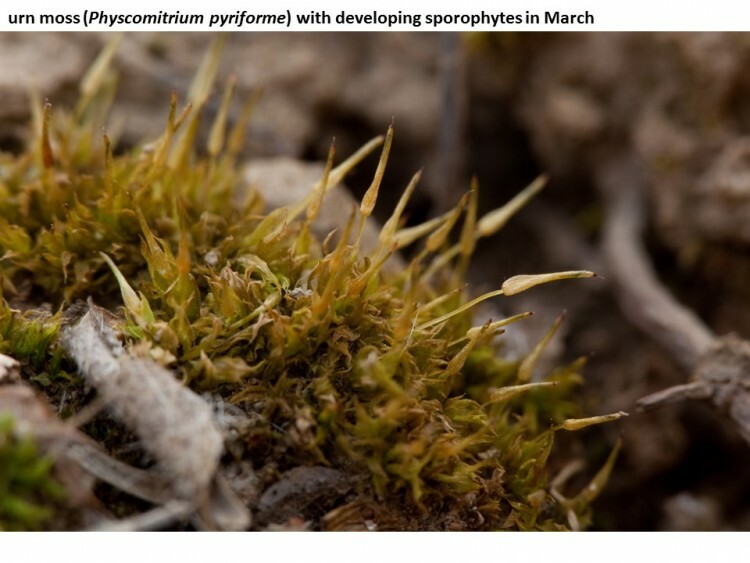 As a typical member of the Funariaceae, this is a short lived acrocarp (cushion moss) found mainly on bare soil in farm fields. 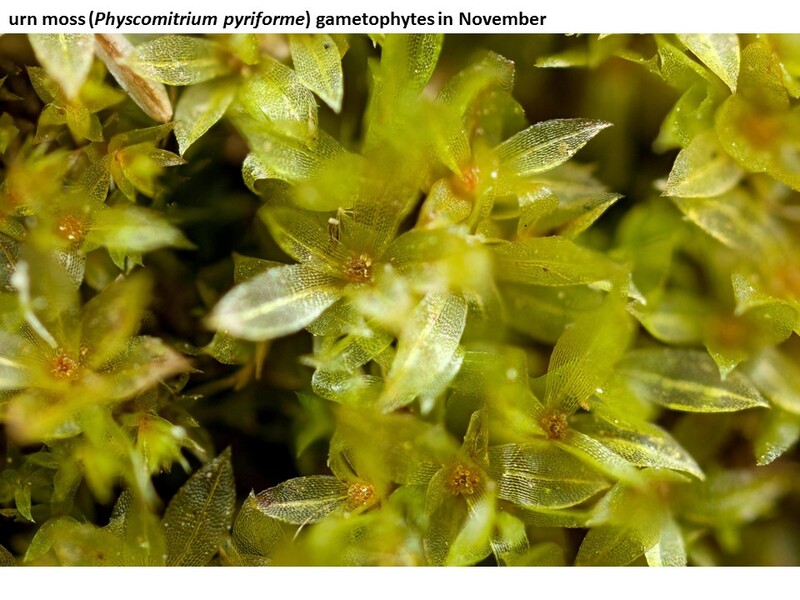 Let’s look at the life history of Physcomitrium pyriforme. Protonema can be seen in early spring, from which leafy shoots (gametophores) soon develop. 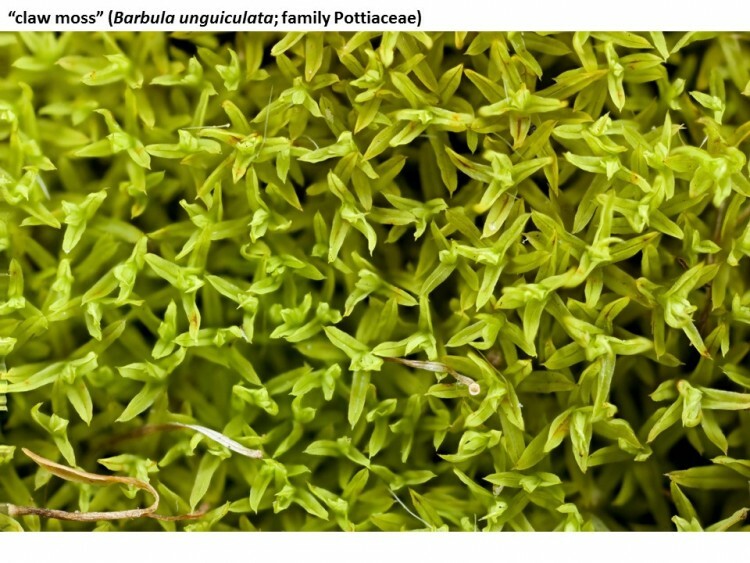 The stems grow all summer long, and are often densely clustered. Sexual maturity is reached about the middle of autumn. 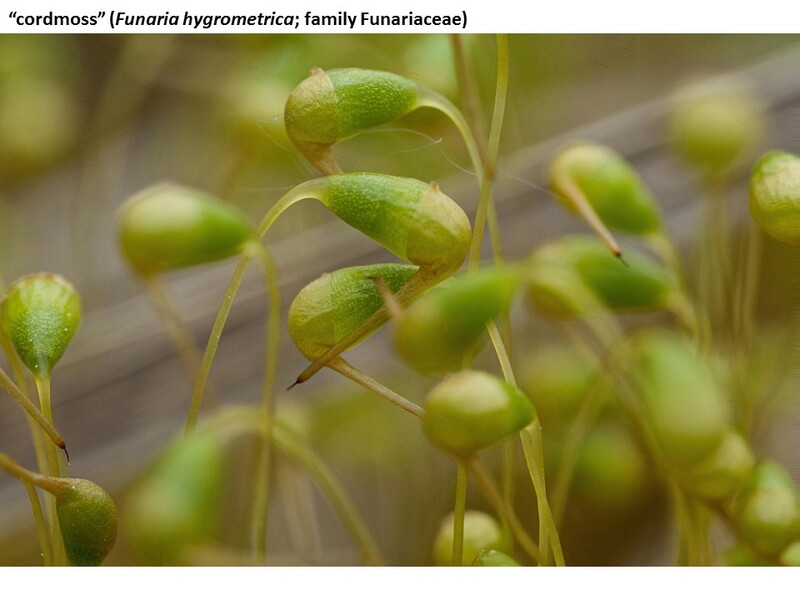 The species is cladoautoicous, meaning that is has separate male and female branches on the same individual stem. 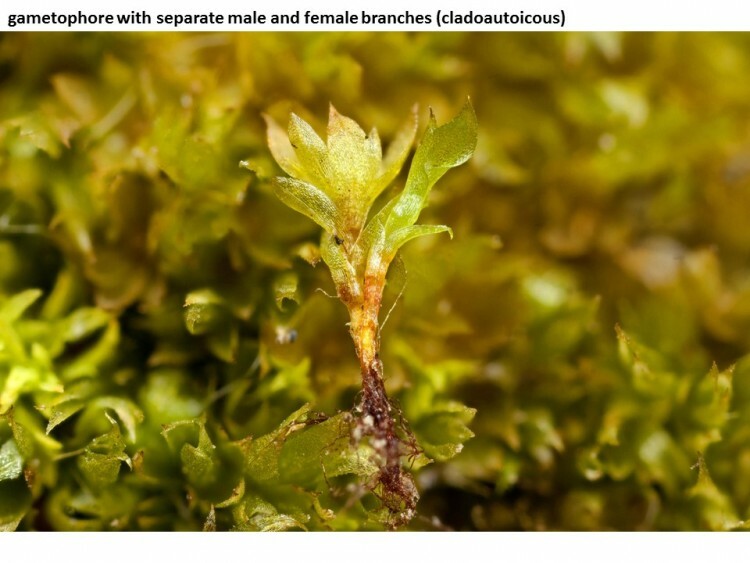 On this photo, the male branch is on the left, female on right. The perigonial leaves are arranged in a rosette, forming what may be a splash cup. 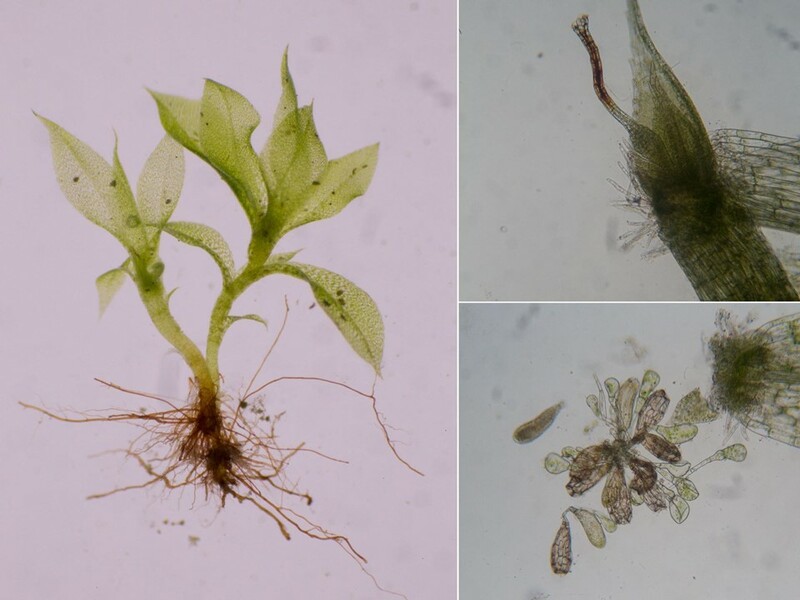 Even without a lens you can see their clustered antheridia, with capitate paraphyses. 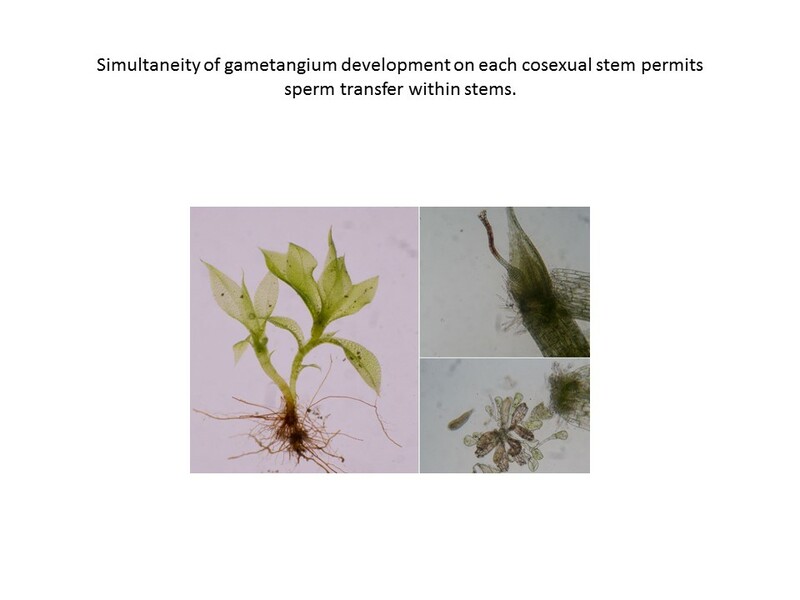 The male and female gametangia mature simultaneously. The photo below shows a gametophore with a male branch on the right, female on the left. 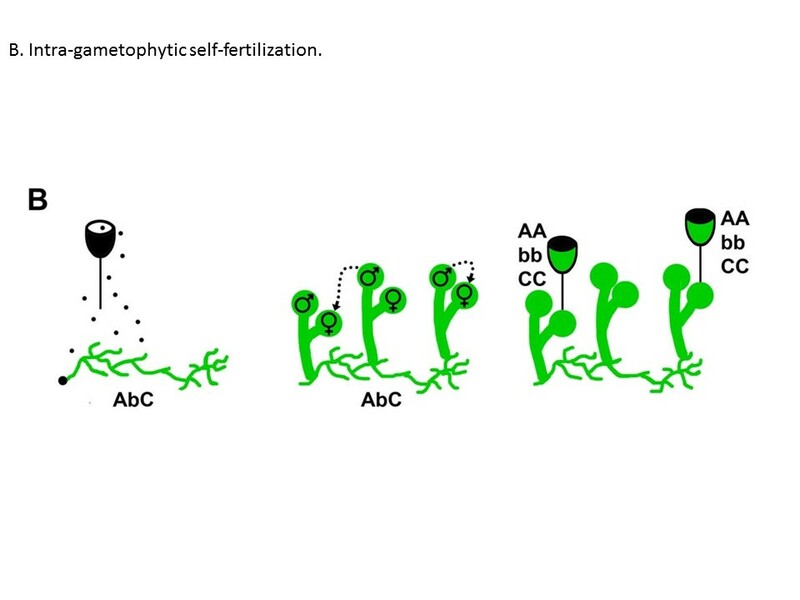 See in the upper right a just-fertilized archegonium with swelling base containing the zygote, and a degenerating venter (the neck of the archegonium through down which the sperm swam). The lower right shows recently dehisced antherida. 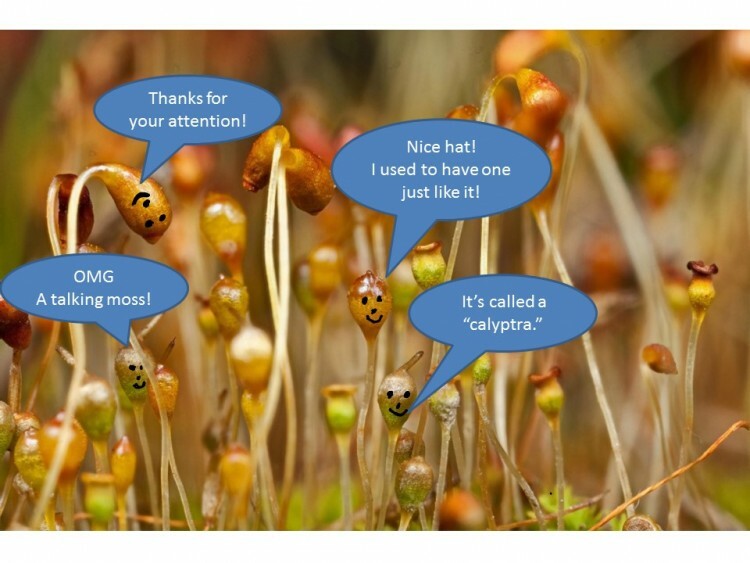 The sporophytes mature all winter long. Capsules are ripe in spring. 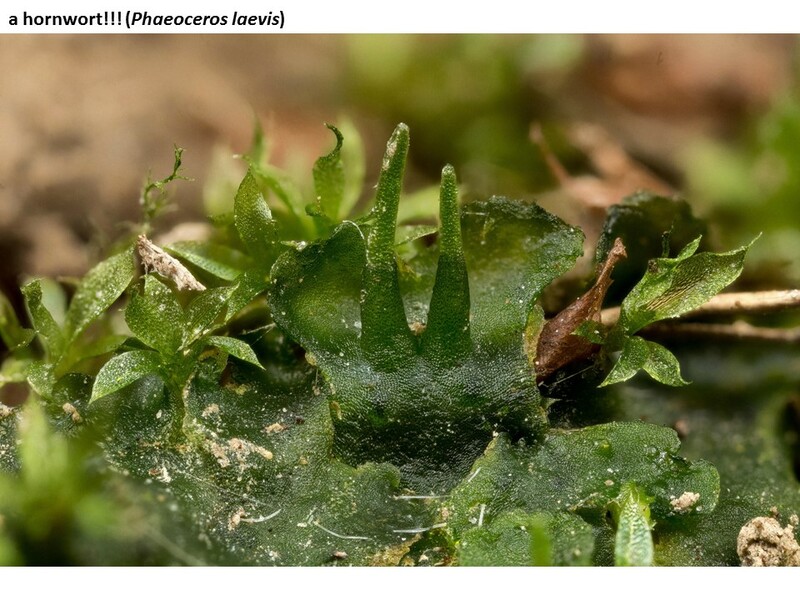 The capsules are upright, and the peristome lacks any teeth to regulate spore dispersal. 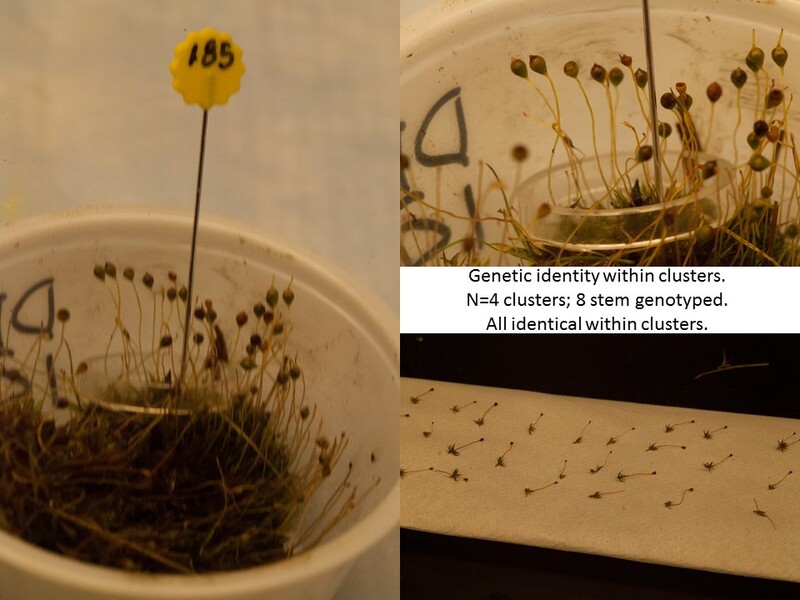 I think it might be some sort of ballistic dispersal, because it’s almost impossible to find any spores in recently dehisced capsules, even though they’re upright. I’m interested in plant breeding systems –whether mating occurs by selfing or outcrossing. 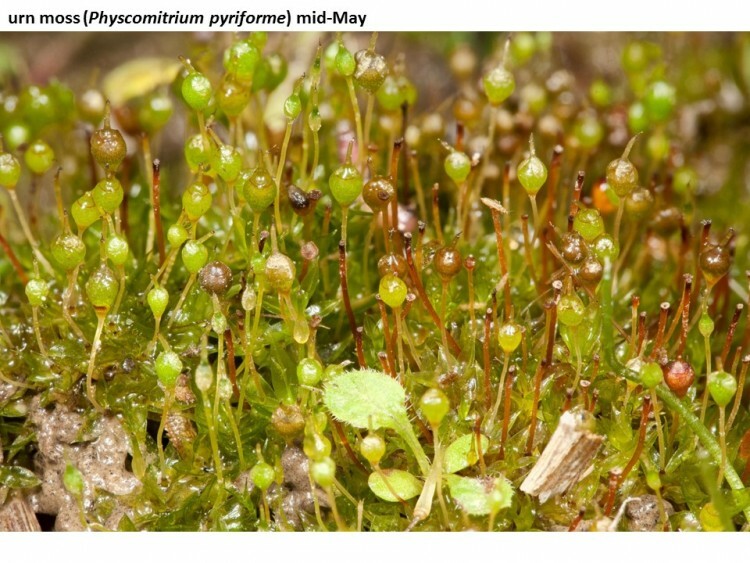 For a short-lived cladoautoicous moss such as Physcomitrium pyriforme, self-fertilization seems likely. That turns out to be the case. 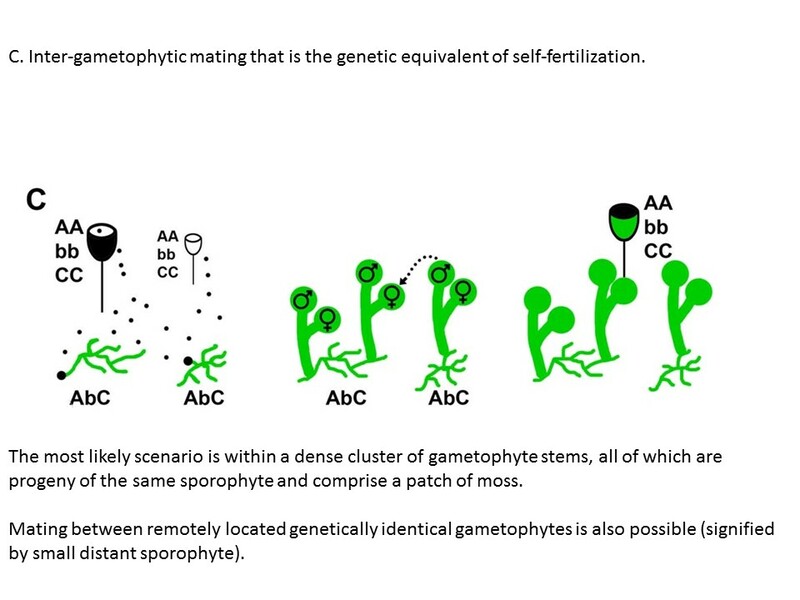 And for a short-lived self-fertilizing plant, another thing might seem likely (especially with my usual luck). One might expect occurrence in populations with no readily detectable genetic variation, hence no distinguishing genetic markers, and therefore no research program. Happily, that wasn’t the case. 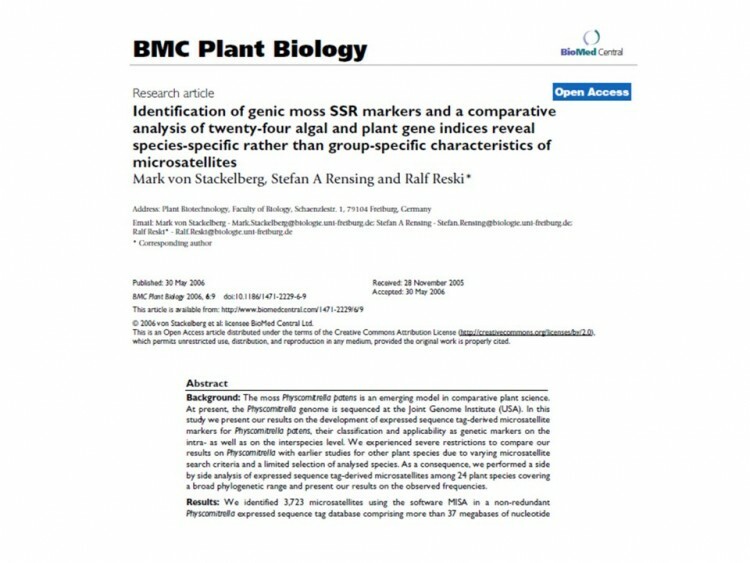 In late 2011 I became aware of this wonderful study by a German research team –an examination of microsatellites in the moss model organism Physcomitrella patens. 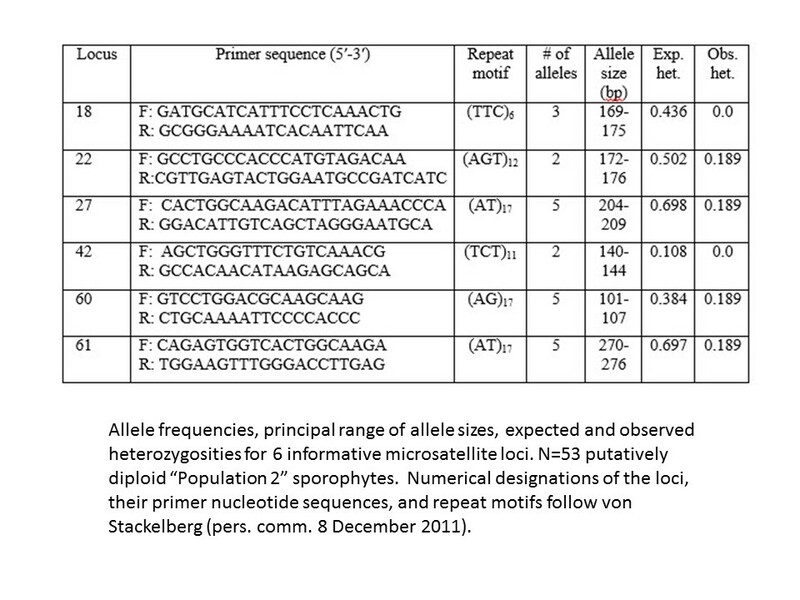 The authors generously sent me their notes on a spreadsheet showing primer sequences and other pertinent information. During 2013 I tested 35 pairs of primers and came up with a set of six that amplified well. Having two to five alleles per locus and fairly high expected heterozygosity, taken together in multilocus fashion, it was possible to was able to distinguish individual genotypes with a very low probability of accidental matches. 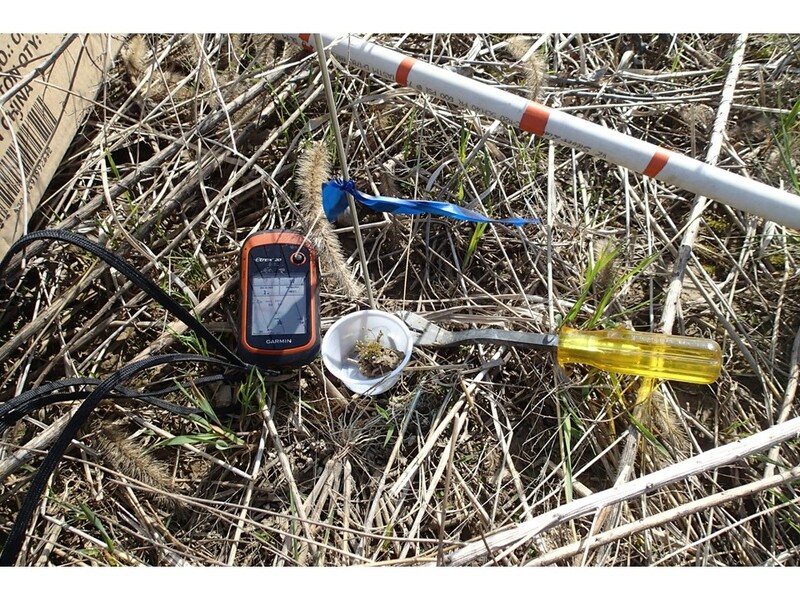 During 2014 I sampled extensively in a nice low-lying 2.5 ha portion of the prairie. Using randomly generated points programmed into a handheld GPS unit. I selected the central-moist moss clump in each of 100 square meter quadrats. GFS, Gordon Food Services, is actually an ecologists supply store. 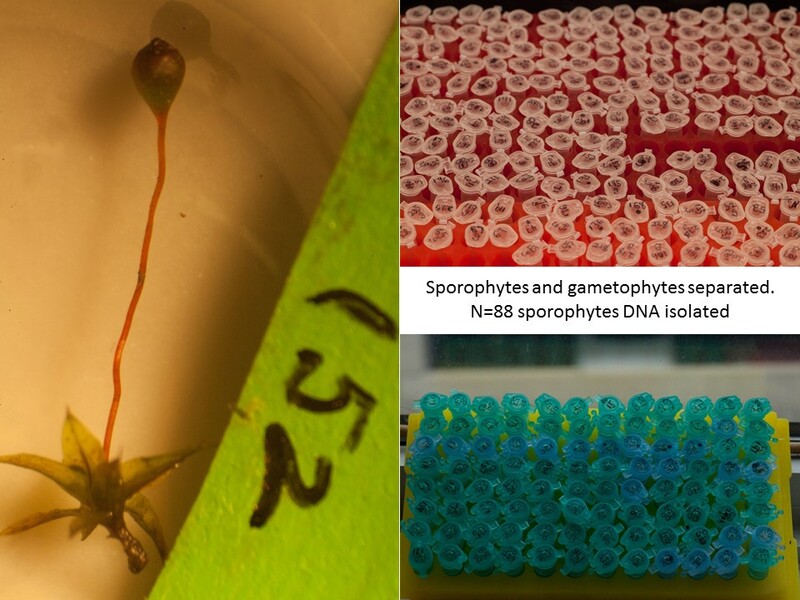 In the lab I separated sporophytes and gametophytes, with the goal of genotyping all the sporophytes, and saving the gametophytes for confirmation if necessary. When I did the SSRs, something immediately seemed odd. 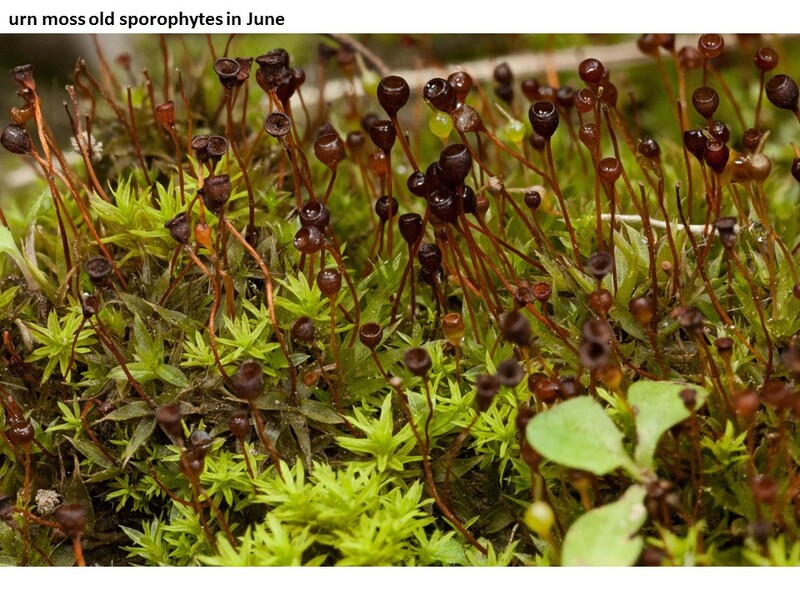 Most of the sporophytes, about three-fourths of them, came out showing neat single peaks for all 6 loci, apparent selfed diploid plants. 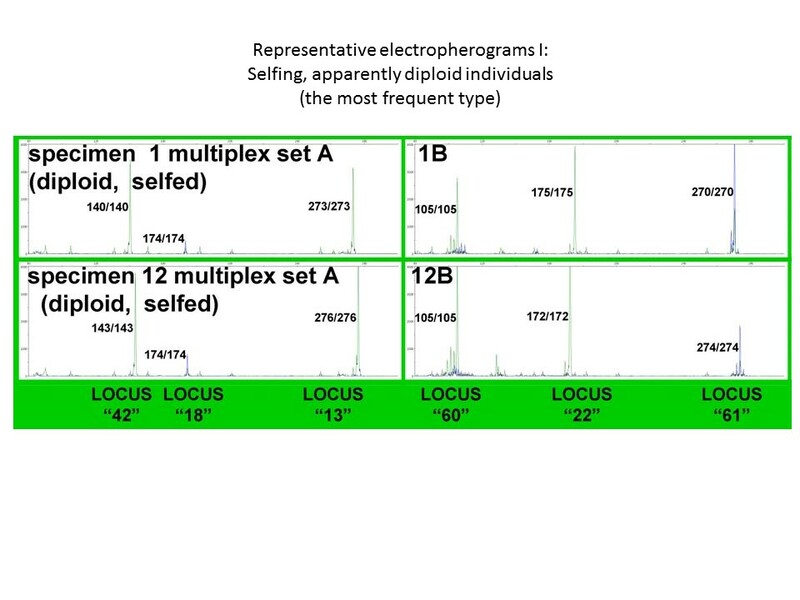 See these electropherograms, the two specimens have different genotypes at “Locus 42,” “Locus 13,” Locus 22,” and “Locus “61,” but they’re homozygous at all of them. That wasn’t what was odd. 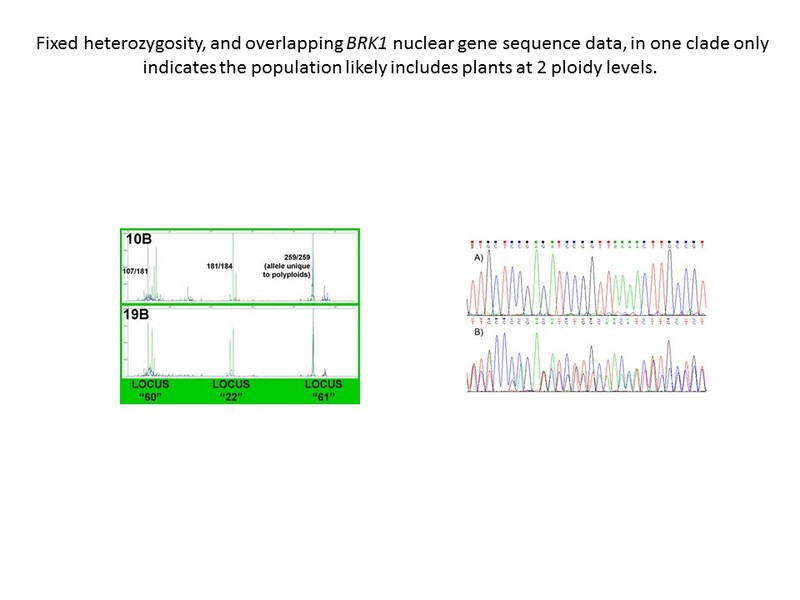 What was odd was that a quarter of the plants showed a lot of heterozygosity. Were they outcrossed? It didn’t seem like it. They seemed to have even more heterozygosity than you’d expect, and also some weird alleles –probably additional loci –that weren’t present in the majority of the plants. There were instances of moe than two peaks. They were hard to interpret, genotype-wise, but they really seemed to be polyploids. But it doesn’t seem legitimate to use the same criterion –SSR data used to make inferences about a sample –to select the members of that sample. 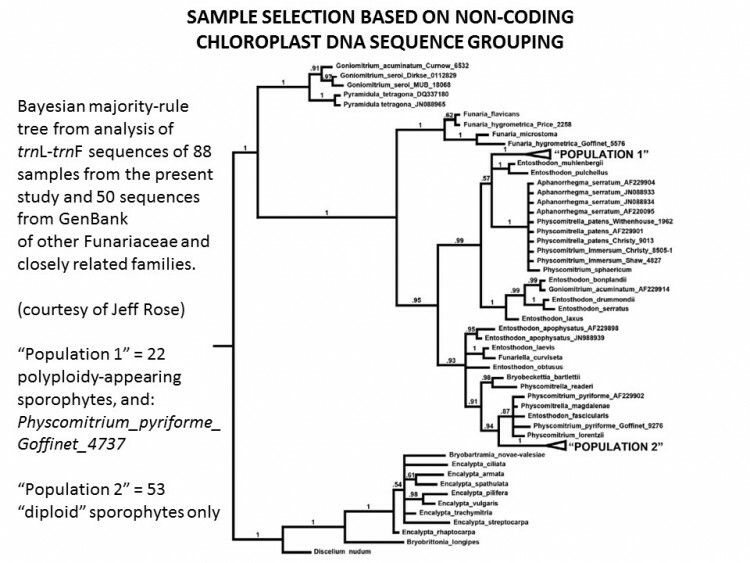 So, as a objective means to define the sample set, I performed DNA sequencing of a non-coding portion of the chloroplast genome, something called trnL-F. 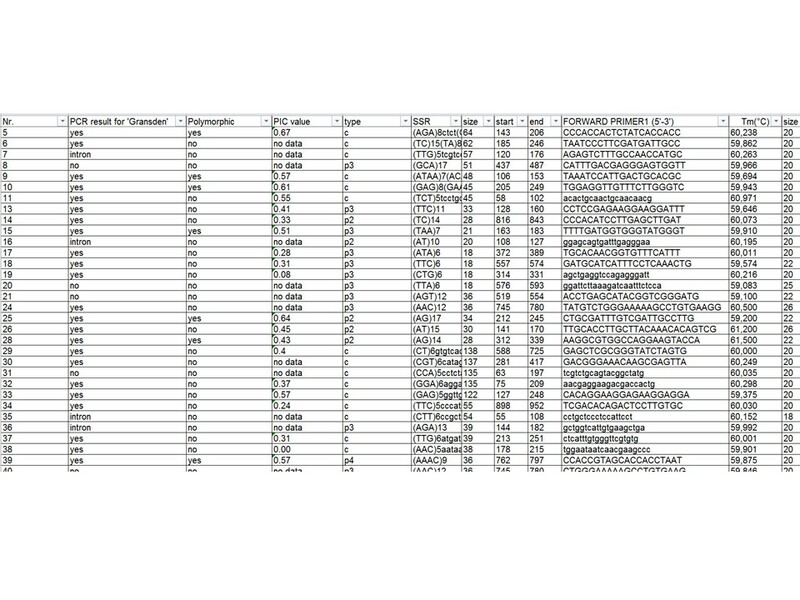 I handed the data to my friend Jeff Rose, who knows how to interpret such things. 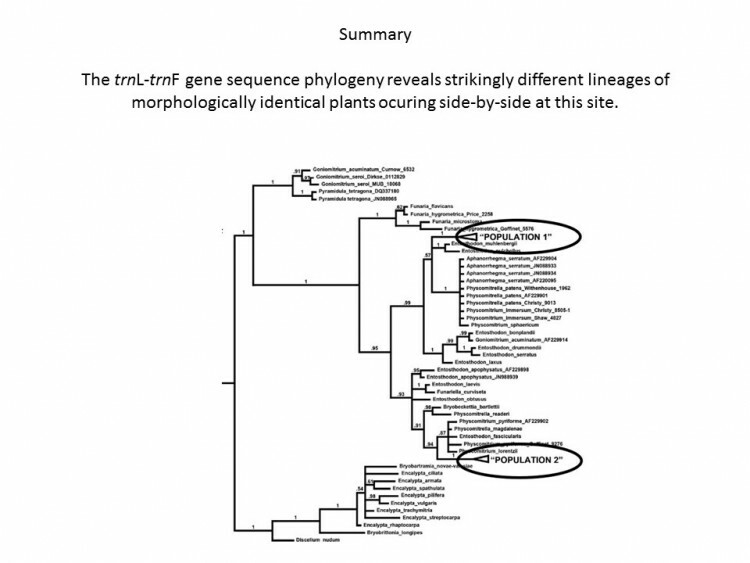 He constructed a phylogenetic tree using my samples and comparable sequences from 50 GenBank records, including other Funariaceae and closely related families. 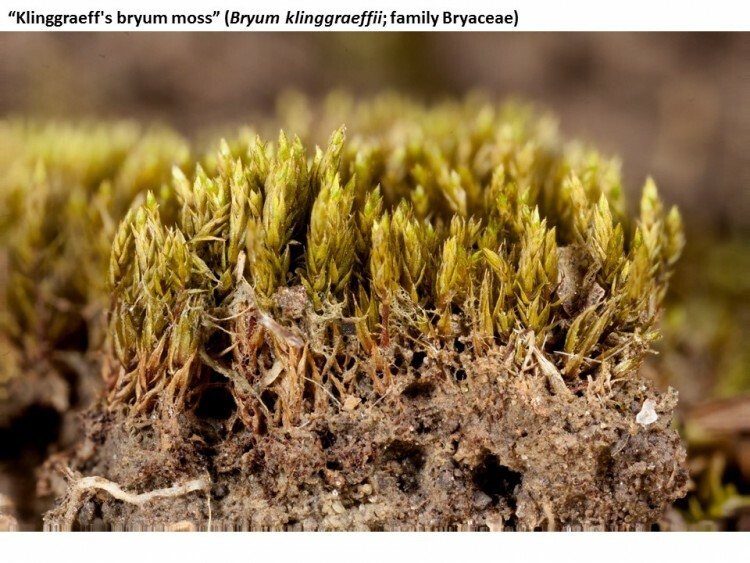 It turns out there is some substantial genetic variation among morphologically identical goblet mosses right here on this one site. There’s other evidence they’re polyploid. First off, I randomly chose 8 of them and 8 of the others for sequencing of a portion of a nuclear gene called BRK1. 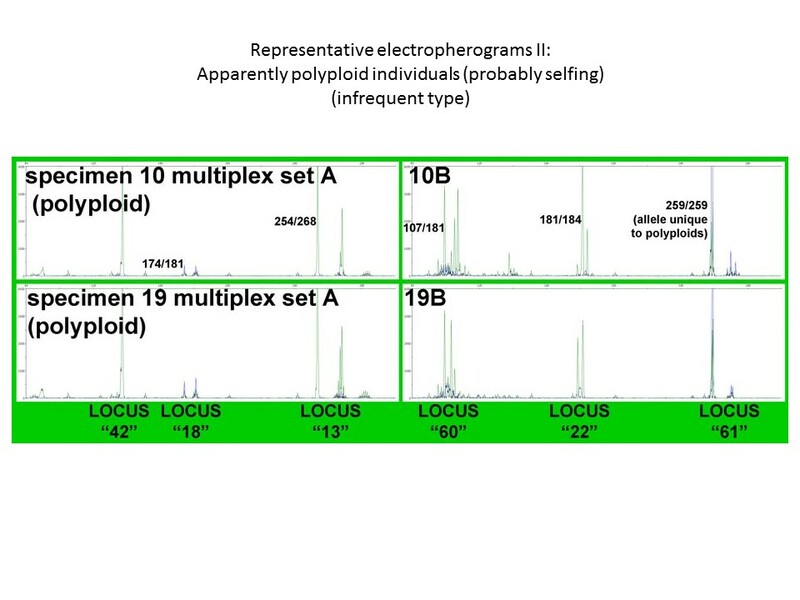 All 8 putative polyploids couldn’t be sequenced because they showed mostly double peaks (the bottom trace B in the photo below). The putative diploids (A) were fine. Secondly, the SSR profiles of the the putative polyploid gametophytes had the same crazy genotypes as did their sporophytes. Fifty-four of the samples –called “Population 2” in the tree — formed a clade all by themselves and were the ones included in the breeding system study. Results! Among the 54 samples, some were identical. 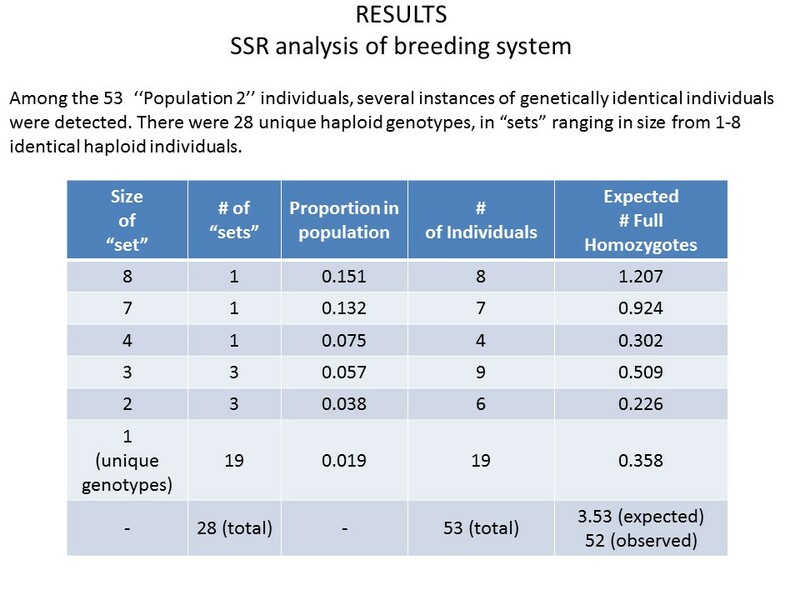 There were 8 that had the same multilocus genotype, 7 with another, 4 with another, three sets of three, 3 sets of 2, and 19 that were unique. I hope that adds up to 54. 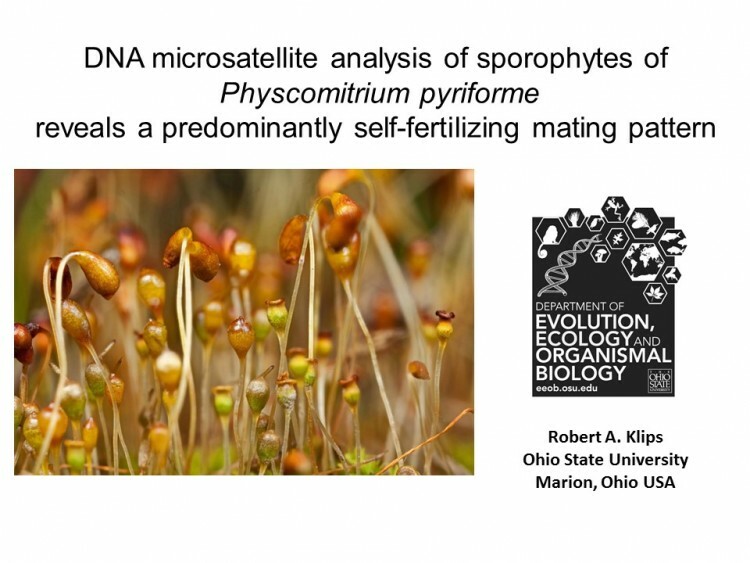 So even under the model of random mating, some totally homozygous sporophytes could be expected. How many? Algebra says “3.5.” How many completely homozygous sporophytes were there? Fifty-three, out of 54. There was just one outcrossed individual! There’s some uncertainty about how exactly this selfing occurs, or indeed if it actually is selfing in the strictest sense, which suggests avenues for further research. 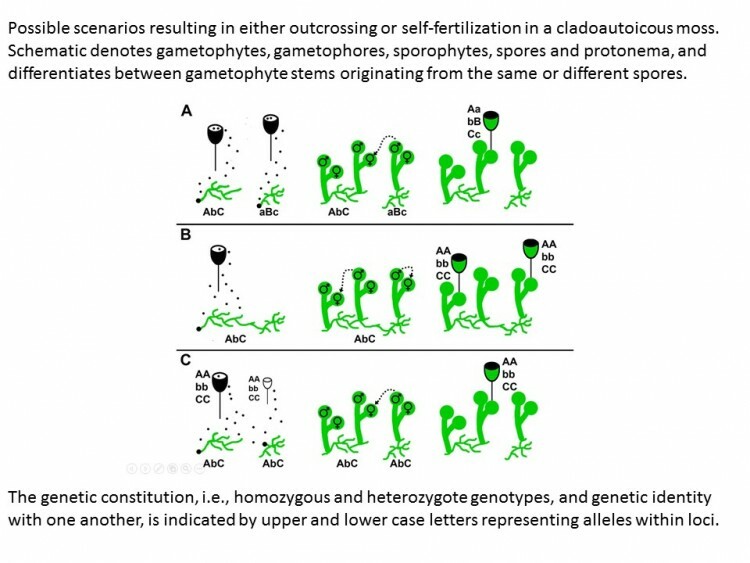 On this set of diagrams, dots are spores and the the green webbing is protonema, from which arise one or more bisexual stems, which I’m carefully calling “gametophores” to distinguish them from “gametophytes,” defined as everything that develops from a single spore. 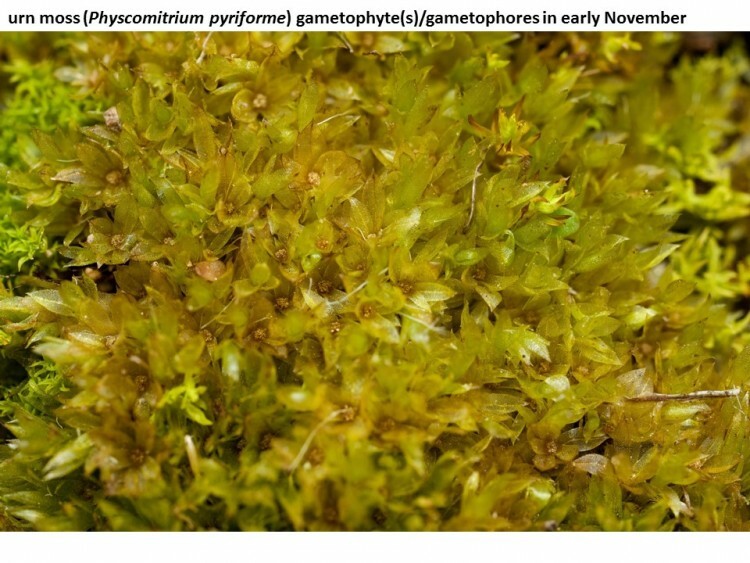 A gametophyte may consist of more than one gametophore. 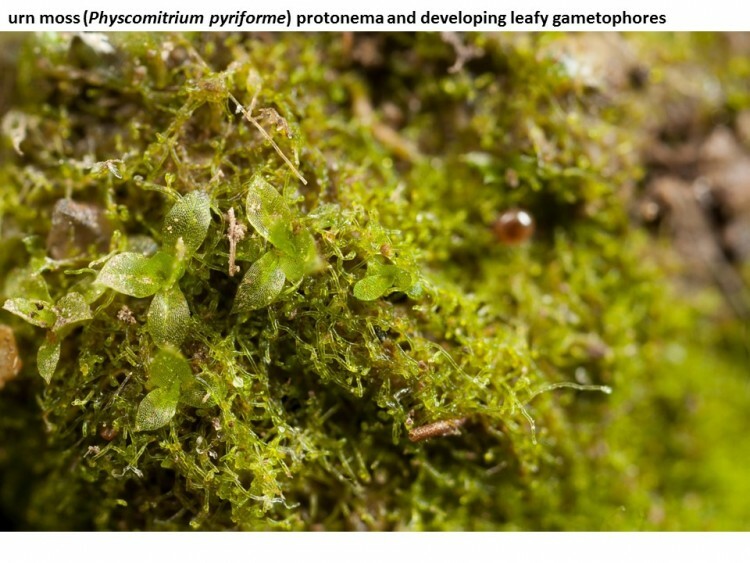 Within-gametophytic selfing can occur two ways, either between antheridial and archegonial branches on a single stem (gametophore) or between gametophores that each arose from the same protonema (i.e., from the same spore). 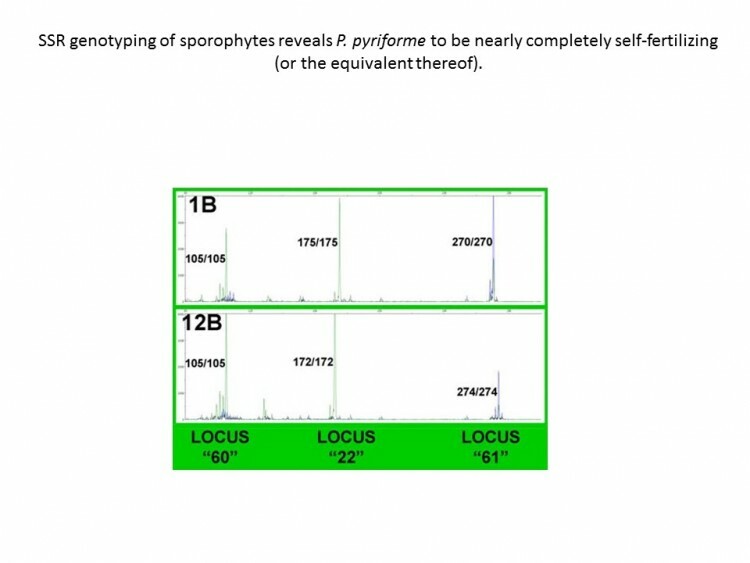 In both cases the result is a diploid sporophyte that is homozygous at all loci. To visualize this, imaging starting with a selfed sporophyte sometime in the past, very likely just the preceding year. A capsule, or maybe several, spills hundreds or thousands of genetically identical spores, resulting in what are in essence clones, and when they “outcross” they’re pretty much selfing. 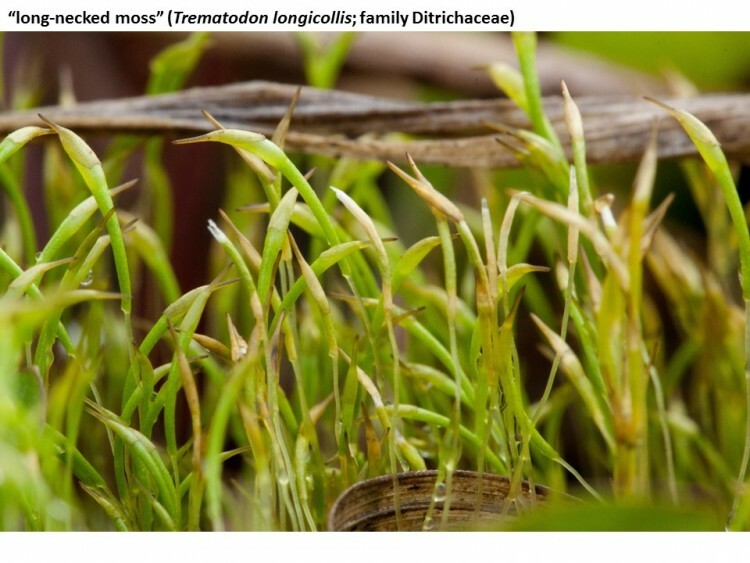 So if you were able to closely track the development of this tangled mess of green thread, there may have been many spores contributing to it, and those leafy shoots coming up are actually those of separate gametophytes, in the strict sense we’re talking about here, not just stems of the same gametophyte. 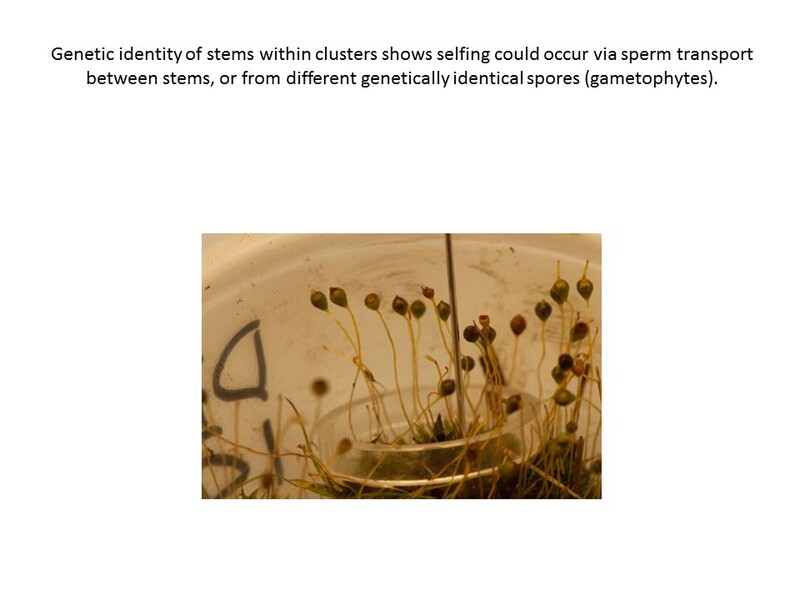 But they’re genetically identical, because of a heritage of selfing, Growth chamber studies might help here, using mixtures of spores of different genotypes. 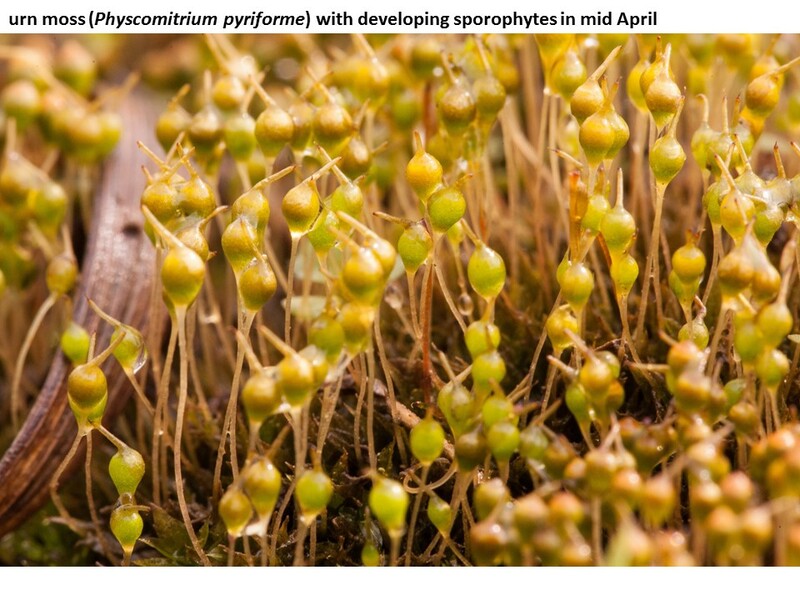 Regardless of whether adjacent stems (gametophores) in a dense moss clump arose from one extensive and multi-stem-producing protonemata or from many wee little few/single-stem-producing protonemata, it seems that mating among them would result in the same thing: fully inbred sporophytes. Evidence for this came from a small but suggestive assay of the SSR genotypes of eight closely neighboring stems from four different moss clumps. Within each clump, they were all identical. Goblet/urn/bladder moss occurs in at least two genetically distinct lineages/cytoptypes at this one location! Perhaps there’s more than one species here? About 25% of the plants are apparently polyploids. The plants are predominantly self-fertilizating (or the genetic equivalent thereof). 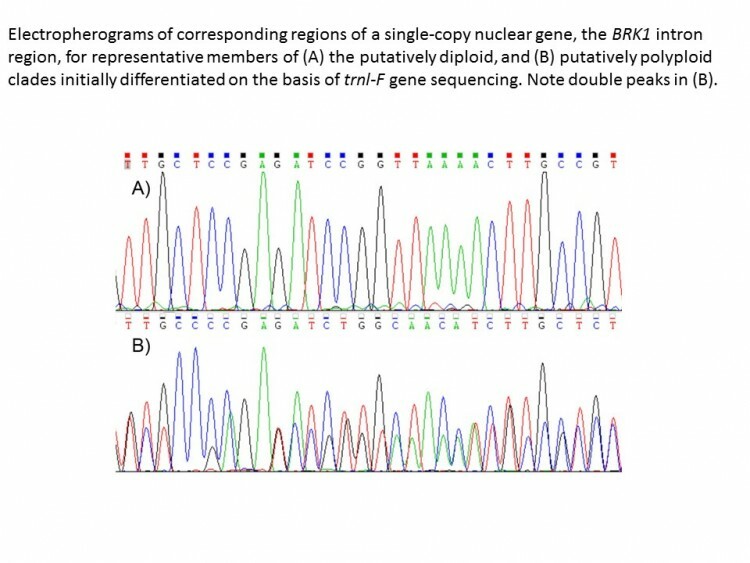 Clumps are likely composed of genetically identical individuals. Acknowledgements! 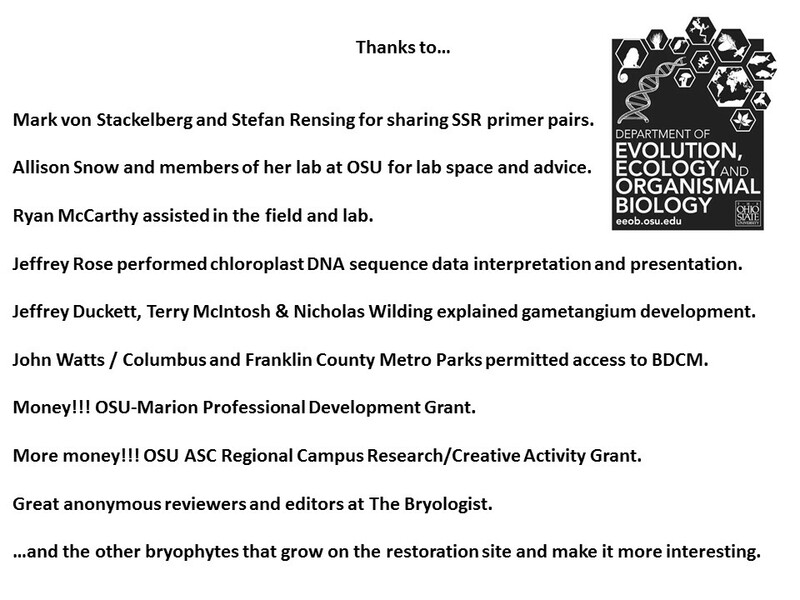 In addition to the people I’ve already named, I especially thank my friend and OSU colleague Allison Snow for welcoming me into her lab. Yes! 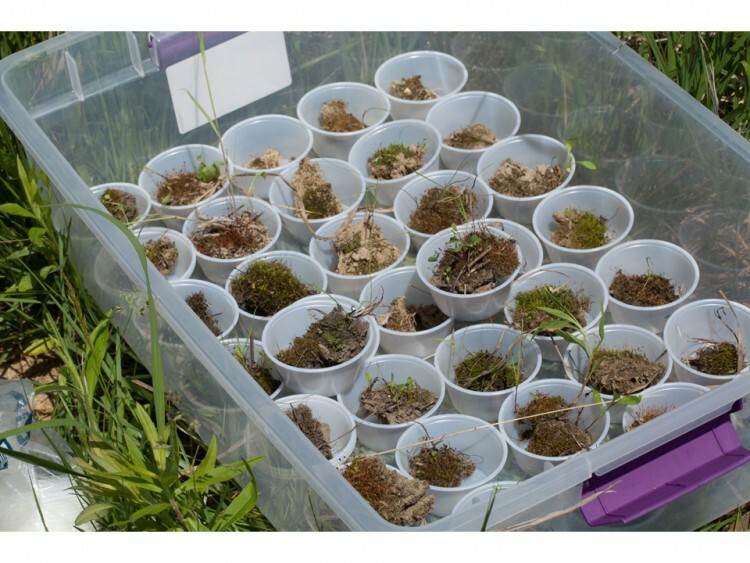 The wet prairie restoration sites are surprisingly rich in bryophytes, especially during the early stages. Mostly, they are are acrocarps (cushion mosses). 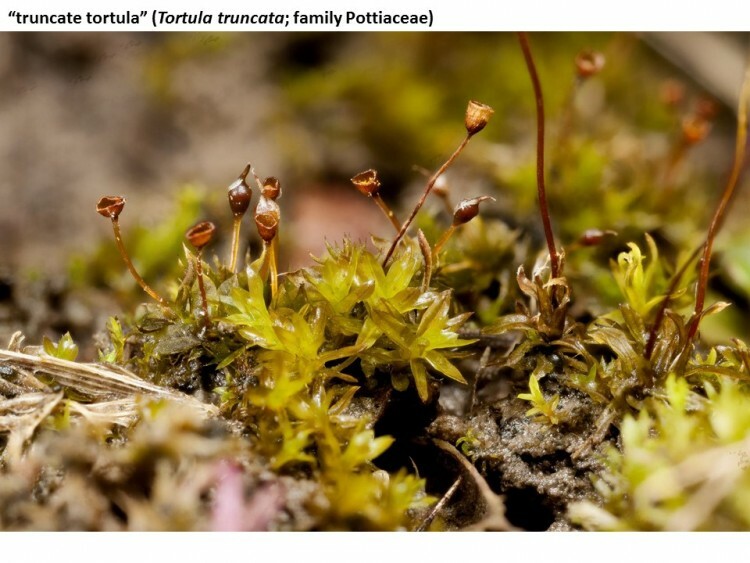 The Funariaceae is quite well represented. 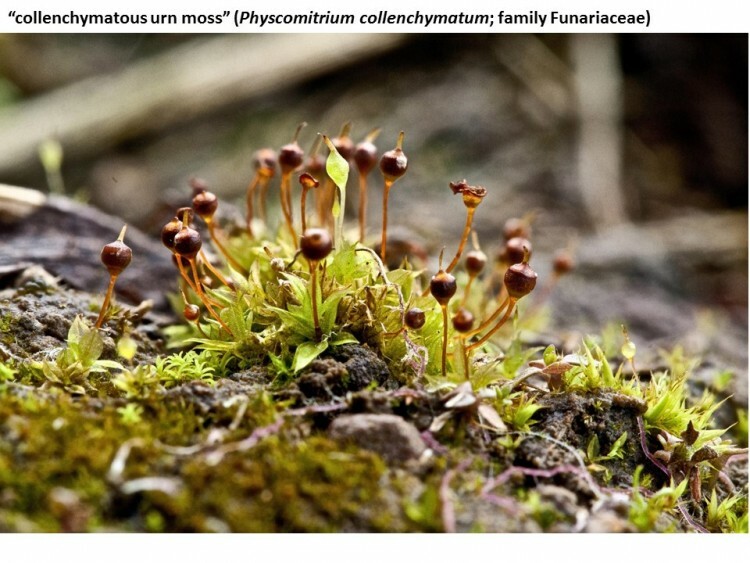 Physcomitrium collenchymatum is a great rarity that only occurs in North America. This is the only known Ohio locations. Funaria hygrometrica is abundant in a some especially low spots. 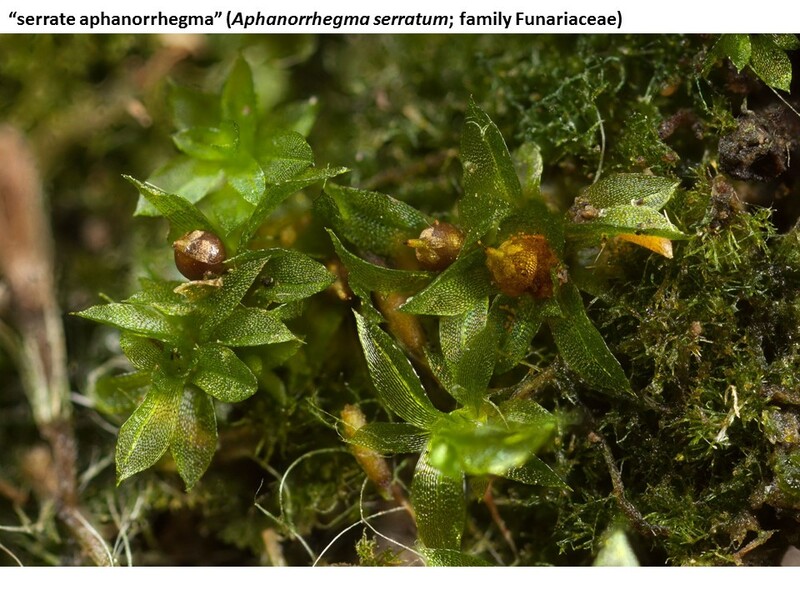 Aphanorrhegma serratum is a fall-fruiting species that is gametophytically very much like Physcomitrium pyriforme, but the capsule is immersed. 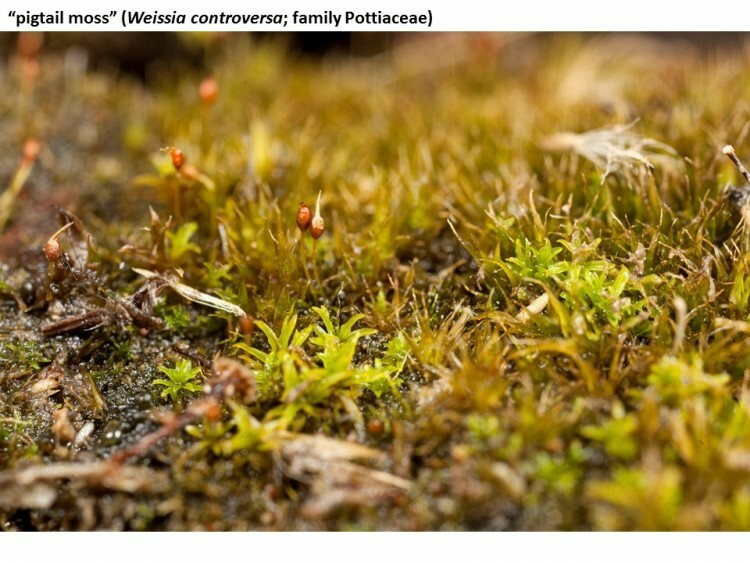 The Pottiaceae also contributes its fair share of mosses to the meadow. 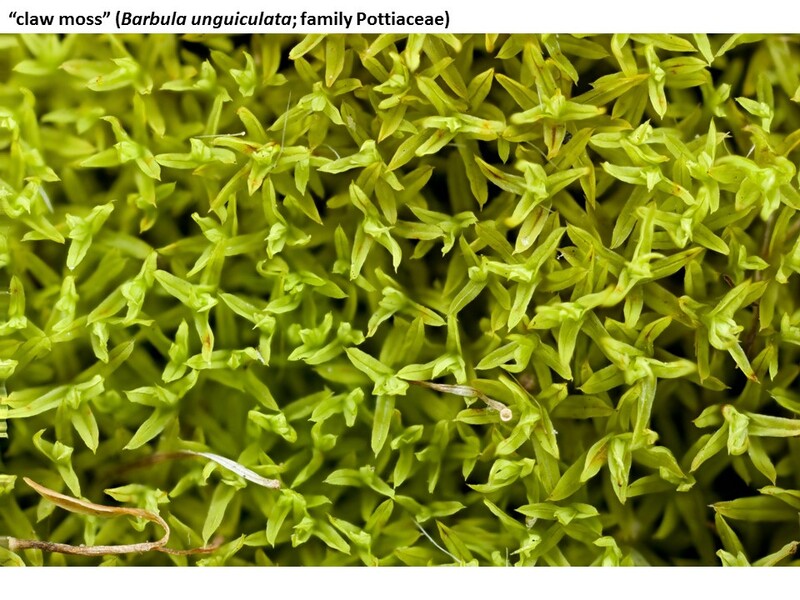 One of the most abundant mosses here, apparently coming in later and staying longer than the urn moss, is Barbula unguiculata. 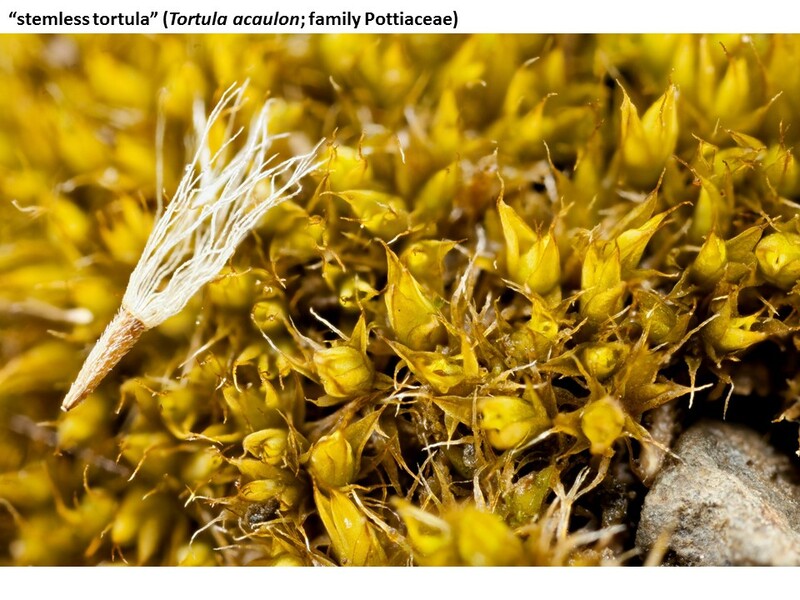 Tortula truncata is a fall ephemeral that has an overall aspect much like urn moss. Tortula acaulon is a practically stemless yellowish moss with capsules that are completely surrounded by leaves. Weissia controversa is small, tufted, with peculiarly inrolled leaves. 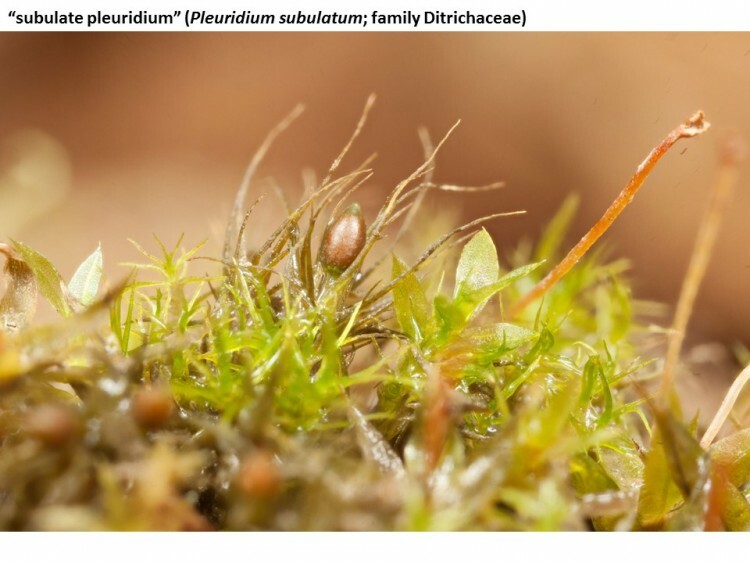 Members of the genus Ephemerum (two of which were seen during this study –the one shown below and also E. crassinerveum) are tiny, with a persistent protonema and sessile globose capsule. Bryum argenteum is a weedy moss that is dioicous (separate male and female gametophytes) but nonetheless frequently forms sporophytes. 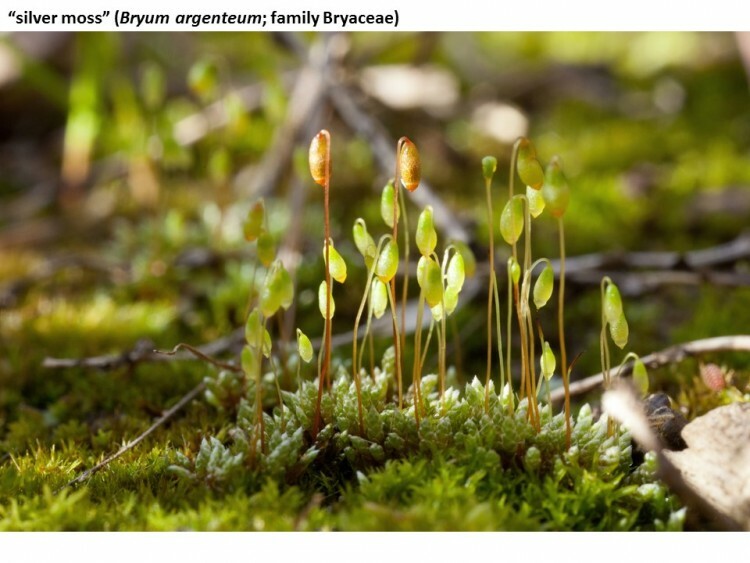 Byrum klinggraeffii reproduces by tiny potato-like asexual tubers in its rhizoids. 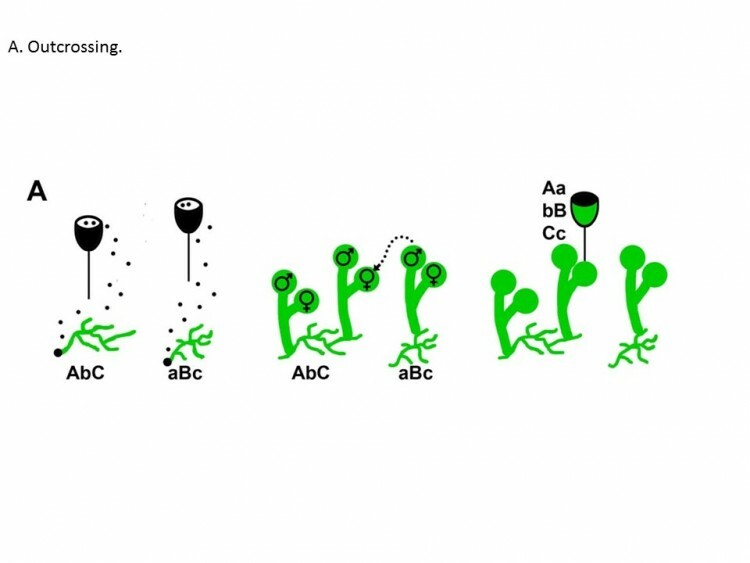 It also has three double letters in its specific epithet (gg, ff, and ii). Trematodon longicollis stuck its neck out once in early spring. Pleuridium subulatum is a narrow-leaved acrocarp with odd little ellipsoid capsules that break apart from the parent plant when mature. 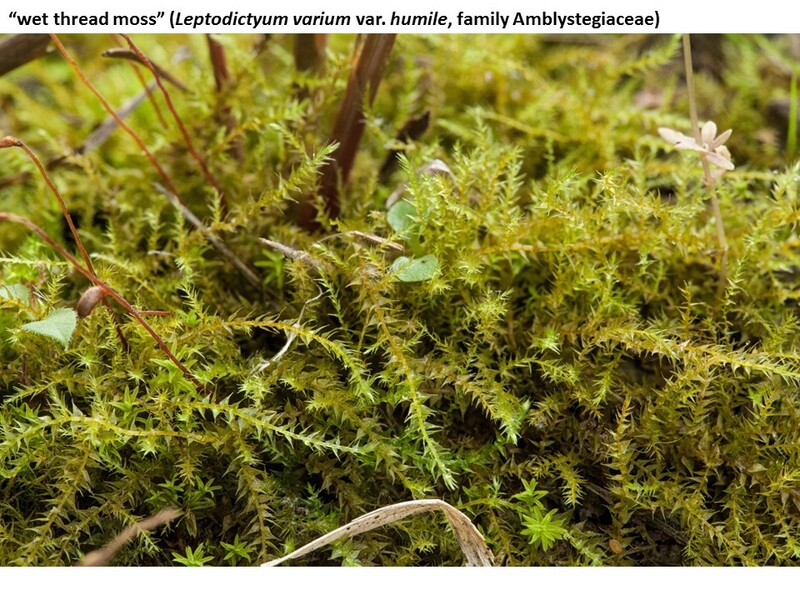 The only pleurocarp (carpet moss) that i observed was Leptodictyum varium variety humile. 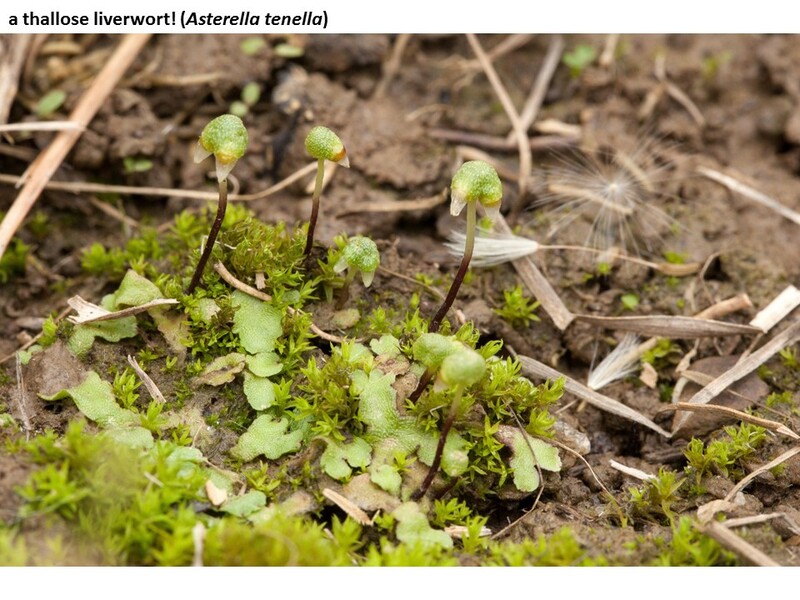 A thallose liverwort, Asterella tenella, was observed only once. 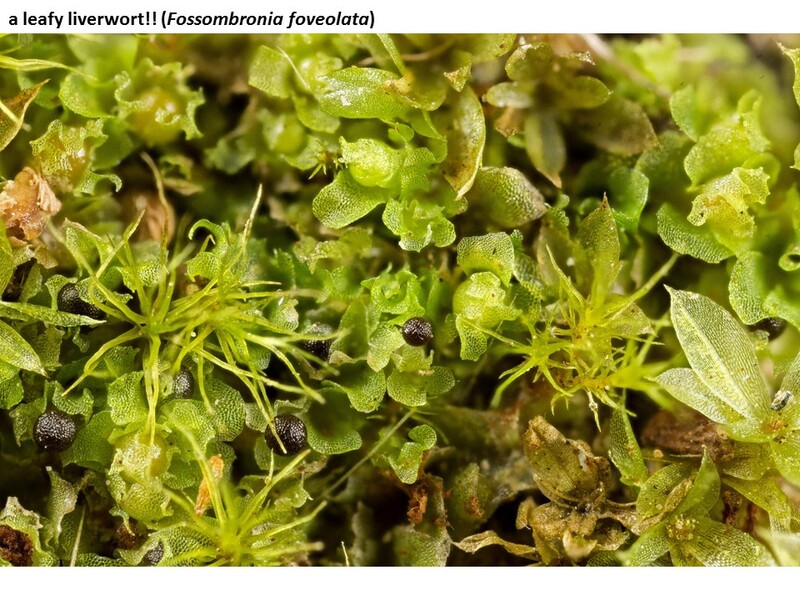 A leafy liverwort, Fossombronia foveolata, was abundant one year at least. There was even a freakin’ hornwort! Thanks for your attention. If you’re interested in reading the article that appeared in The Bryologist 118(2):200-211. 2015, here’s a link to the abstract and references. If you can’t conveniently go through a library to get the entire article, drop me a line and I’ll send you a copy.